Architects Spencer and Temple completed this academic building in 1959 in Champaign, IL. Starting as a four classroom school in 1910, Dr. Howard Elementary was built in response to increased district enrollment. In 1910, the school was only a four room, two story school with a basement and was completed at a price of $17,986 (Knepp 20). The school would go under a total of four additions over the next forty nine years. The first addition was to come a decade later in 1920 in which four more rooms were added to the south of the original building. The next two additions would continue to move the building south in the years of 1931 and 1953. 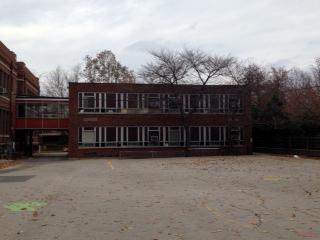 In 1959, another addition was made on the east side of the original building. This addition could almost be considered a separate building as it only connects to the original by an elevated hallway that connects the upper stories (History of Champaign Public Schools). 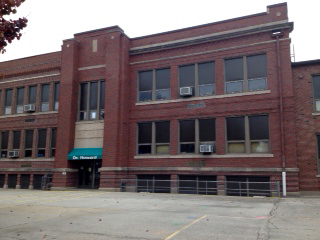 Dr. Howard Elementary is a unique building as it displays the differences and advancements made in schools since 1910. The original building in 1910 was built as a typical prairie school at the time, and even contained cloak rooms. Cloak rooms are small rooms or corridors adjacent to the classroom for students to put their coats during class. These cloak room were considered necessary at the time as it was considered unsanitary to keeps that coats and hats in the classroom (Donovan 249). In the newer sections, the students have lockers and coatracks for there coats. The building in 1910 was heated using fireplaces. 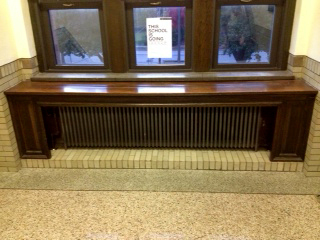 During the 1931 addition, the building was converted to be heated by radiators. Today, the school is heated by using a forced central air furnace, but the old chimneys and radiators can still be found. Back in the 1920s, school fires were frequent and were a main concern for school officials. 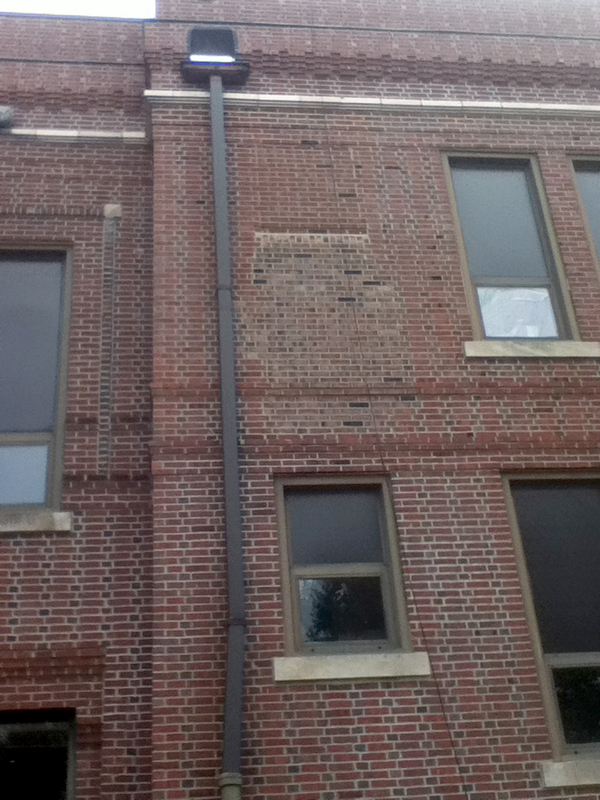 To help children evacuate the building, many schools installed "fire chutes" in which children on upper stories could use as a slide to evacuate the building. 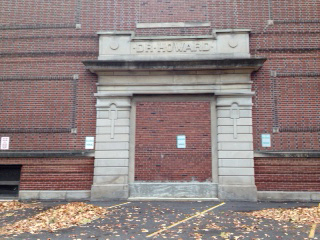 Dr. Howard Elementary featured two of these chutes on the west side of the building. One was located in the upper level of the 1910 building and the other in the 1920 addition. These chutes have since been removed, but their locations can still be seen by the discolored bricks used to close them off (Trentz 2013). 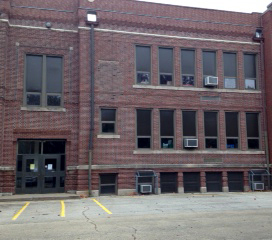 Dr. Howard Elementary is located on land donated by Dr. Hartwell C. Howard, one of Champaign County's first doctors. The building was named after Dr. Hartwell C. Howard upon the completion of the original building in 1910. The school board at that time had a meeting on April 30, 1910 to determine the name of the new school. Interestingly, this was a Saturday. Dr. Hartwell C. Howard was able to decide between three names. The names were "Howard", "Dr. Howard", and "Hartwell C. Howard" (Kacich). Dr. Howard Elementary School was built to serve the school districtís need for a location to house some of the lower grades due to a large increase in student enrollment. The school soon became one of the first schools in Champaign County to accept children with disabilities and autistic needs. 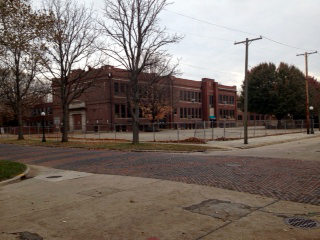 The design of the original building is based very closely off of the Prairie School Design. The design is usually identified by a flat roof, solid construction, horizontal window bands, and a limited use of decoration. As the building was added on, the style was preserved as the additions were closely matched to the original in an almost symmetrical pattern. also located on the first floor. need for upgraded facilities and began proposing ideas to the community. In 2006, the school proposed to demolish the Dr. Howard facility and rebuild on the same site with a larger schools to serve more students in a modern facility. Many parents and even locals without children in the district opposed the idea. The residents said that the site was too small for the new school and that Dr. Howard should be renovated (Heckel). The proposal failed to pass later that year. The school has since then received several updates over the next few years, but the district is still deciding what would be the best way to move forward to better serve students. It is still uncertain as to how the Dr. Howard facility will be part of this future and whether the building will be preserved or demolished (Trentz). Inman Hotel located in Champaign IL. 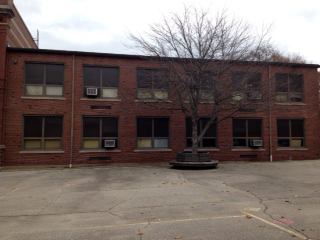 Sangamon Elementary School (also known as Mahomet Grade School) located in Mahomet IL. Lung, Brandon, Myah Price, and Joshua Siebert, “Dr. 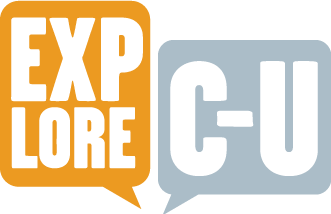 Howard Elementary School,” ExploreCU, accessed April 20, 2019, https://explorecu.org/items/show/302. National Register of Historic Places. U.S. Department of the Interior.17 Nov. 2013 Web 18 Nov. 2013 Trentz, Jill. Personal Interview. 28 Oct. 2013. Kacich, Tom. "The Origin of Dr. Howard School". The News-Gazette. 30 April 2010. Web. 29 Oct.2013. "History of Champaign Public Schools" Champaign Schools. Unit 4 School District. 2 Jan. 2010 Web. 24 Oct. 2013 Heckel, Jodi. "Some residents donít want to see Dr. Howard School demolished". The News-Gazette. 24 April, 2006. Web. 1 Nov. 2013 Knepp Carol, "Historic Schools: Renovation or Replace." Preservation Matters: Preservation and Conservation Association 25.6 (2005): 20. Print. John J. Donovan. School Architecture: Principles And Practices. New York: The Macmillan Company, 1921. Print.